The past week has been a true whirlwind with Master Sticky turning four on the 16th May and Mr Sticky 40 on the 17th. The small person's birthday went on for almost a week, with his nursery party on the Wednesday, his real birthday on the Thursday and then the big finale on Sunday at Mini Mischiefs soft play. The noise 17 four year olds can make is quite astounding ! By Sunday night he was so hyper he didn't go to bed until well past nine. We had decided to celebrate Mr Sticky's birthday on the Saturday by inviting just a few friends for dinner, but as I was working all day that day, I was stuck regarding how to get all the cooking done and get the cakes made. Enter my talented work colleagues and friends Lol and Chris. Lol is in charge of the kitchens in the college canteen and originally from Montserrat. 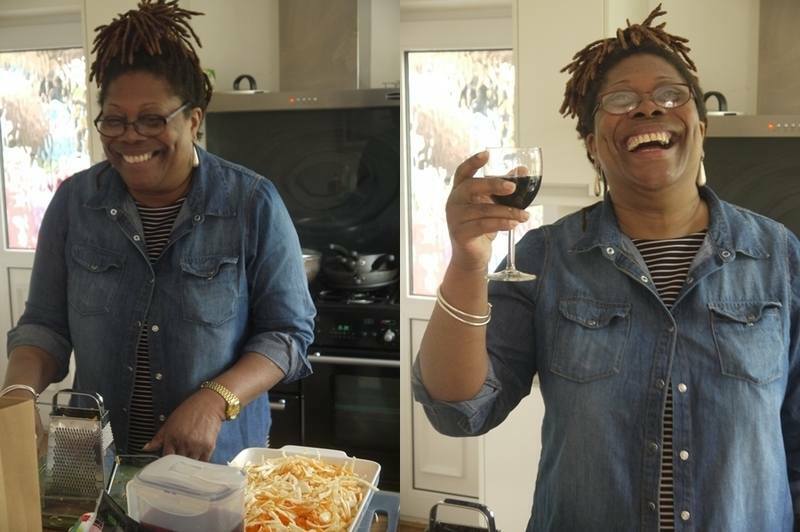 When she heard of my dilemma she promised to cook me a genuine Caribbean feast. Although I was still at work she turned up laden with bags and bags of shopping on the Saturday and got to work. By the time I got home at four she was in full swing, and we treated ourselves to a nice glass of red. There was so much that everybody had to take home doggy bags. Not that anyone minded as it was all absolutely delicious ! 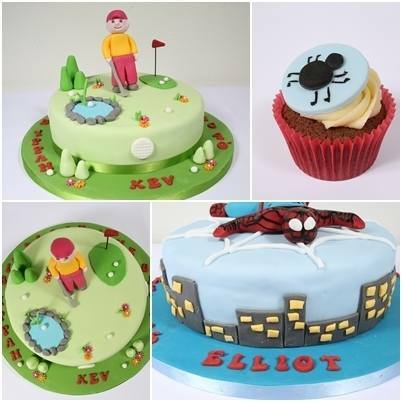 Which brings us onto the subjects of cakes, which were kindly made by Chris from Christine's Kitchen. 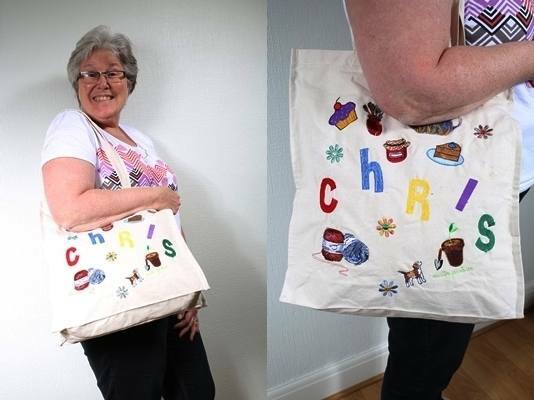 Like Lol, Chrissy refused any payment, so I made her an embroidered bag featuring all her favourite things as a small thank you. Here she is modelling it, see if you can guess what her favourite things are. Her arm is covering the very important teapot. Next to her are the amazing cakes she made. Thanks to Lol & Chris giving of their time and expertise, I managed to give each of the boys a great birthday party. If you would like some help with your parties, both ladies are available for hire - just get in touch and I will pass on your request. There is a wonderful project called "Dress A Girl Around The World" which I became aware of due to the tweets of Louise Horler or @sewscrumptious. "At the beginning of 2011 an article in a sewing magazine about a charity in America called ‘Dress A Girl Around the World‘ caught my eye. 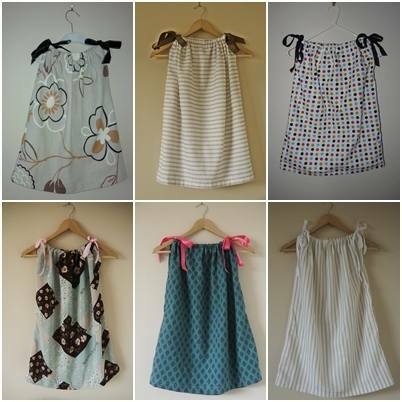 People who could sew were asked to make simple pillowcase dresses which were then delivered to girls living in poverty in the developing world. Girls in countries like Uganda, Rwanda, Haiti and India. 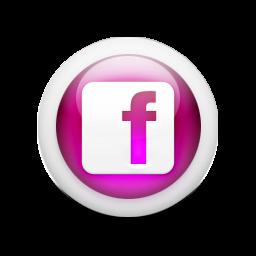 The charity felt that every girl should own at least one pretty dress." 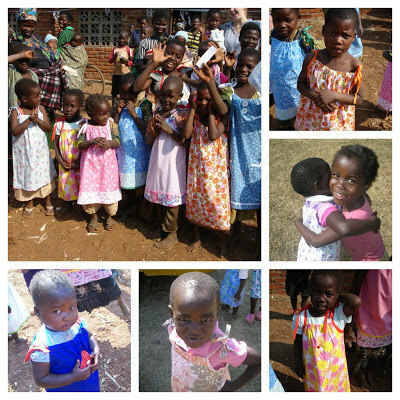 Louise is the central collection point in the UK for the pillowcase dresses and organises distribution to places such as Malawi (pictured above). As you can see one of these little dresses can bring real happiness to a little girl ! The project also encourages sewers to make shorts for little boys. I have now made nine, as once you start it becomes quite addictive ! I have made dresses out of alsorts of fabrics, the only rule is that it musn't be too thick or see through. I have used all new fabric, a bed sheet and tea towels, but you can also upcycle fabric as long as it is in good condition. My Twitter friends, on hearing about my progress and seeing pictures of the dresses, soon joined in and we now have a little Twitter posse made up (in no particular order) of @fishtankfairy @thegreedymagpie and @quilterdown, who have each made at least three dresses already. I have asked each of them for some pictures, so will be updating everyone soon with their little works of art. Other Twitterati who are poised to join the #stitchingsisters ( as we have called ourselves ) are @orinocobunting, @MissKazieB and @wigglemoretimer, and more are ready to make a start in the near future. Two of my Facebook friends are also busy stitching. So, if you want to join in this good cause then please either get sewing and post pictures of your efforts on Twitter using the hashtag #stitchingsisters, or if you can't sew dig out any fabric, sheets, ribbon, etc. that you might have and give it to someone who can. Maybe this will acually make you pick up a sewing machine for the first time and give it a go. @fishtankfairy is a relative novice to sewing, but found the pattern an easy one to follow, so let her be your inspiration. 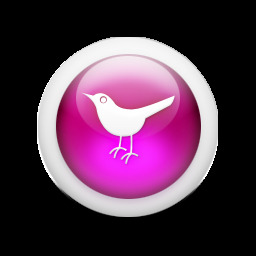 See you on Twitter#stitchingsisters !